Opposite the Habitat and Heals department stores on Tottenham Court Road is Whitefield Gardens which contains the Fitzrovia Mural. The Mural was painted on the side of the building tucked away behind Cafe Nero in 1980 and depicts many people from the local area. The area, although small, is a perfect place for a coffee outside while examining the mural. Cafe Nero is an interesting chain of coffee houses, in an era where the highstreet is bland and corporate they tend to go for high quality frontages to their establishments. The use of subdued colours and awnings to cover outdoor seating areas is notable for its enhancement of the streetscape. Compare this to the Starbucks located opposite Cafe Nero in the panorama and the jarring plastic branding and disregard for the local environment is self evident. 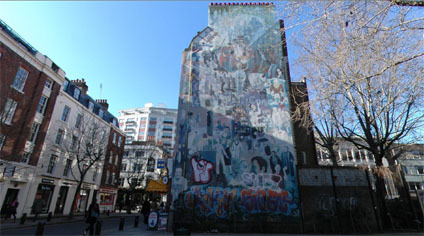 View the Quicktime panorama of the Fitzrovia Mural, London (3.2mb).